In John 8:3-7, a woman caught in the act of adultery is brought before Jesus. When asked if this woman should be stoned, Jesus’ responds with a prophecy concerning the fate of the whore of Babylon during the time of the end. For an explanation of his answer see the following Preterist commentary on John 8:3-7. 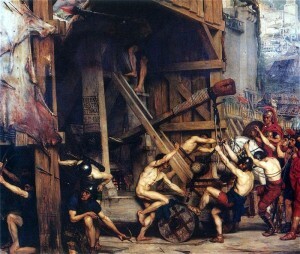 In fulfillment of Revelation 16:21, Jerusalem, the Whore of Babylon, was stoned by Roman catapults during the Jewish War. Stoning is the prescribed punishment for adultery according to the Law. Jesus’ reply to the woman caught in the act of adultery is a prophecy pointing to the destruction of adulterous Jerusalem, the Whore of Babylon, by stones hurled from Roman catapults in A.D. 70. John 8:3-7: A Preterist Commentary: Called the Whore of Babylon in Revelation, Adulterous Jerusalem is stoned by Roman Catapults in A.D. 70 in fulfillment of Revelation 16:21. Stoning is the Prescribed Punishment for Adultery according to the Law of Moses. The teachers of the Law and Pharisees who presented the adulterous woman to Jesus were themselves adulterers in Jesus’ eyes. In Matthew 12:39 Jesus labels these people an adulterous generation (Matthew 23:29-37; 24:21). With this epithet, Jesus links these wicked people to the whore of Babylon who commits adultery in Revelation 17:2. Jesus’ reply to the teachers of the Law and Pharisees is prophetic. 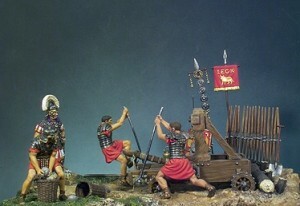 His answer foreshadows the eminent destruction of Jerusalem by stones launched from Roman catapults in A.D. 70. Called the whore of Babylon in Revelation 17, adulterous Jerusalem is ultimately stoned in Revelation 16:21—the prescribed punishment for adultery according to the Law of Moses. In this verse, giant hailstones fall from heaven onto Babylon. The fact that these stones are said to fall from heaven points to a heavenly executioner. Coming on the clouds of heaven at His return, Jesus, the one who is without sin, casts the first stone at the adulterous city. As is implied in Revelation 10:1-2, it is Jesus who guides the Roman army to attack Jerusalem.1 Therefore, it is Jesus that is ultimately responsible for the stoning of adulterous Babylon. 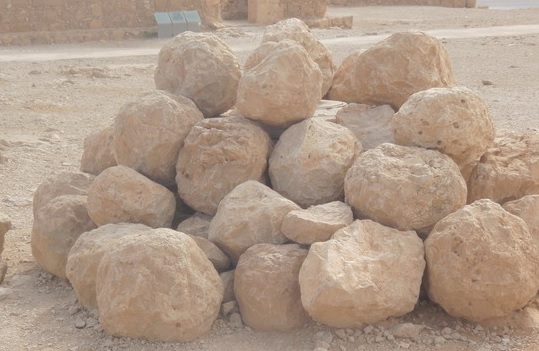 Boulders used in Roman catapults. 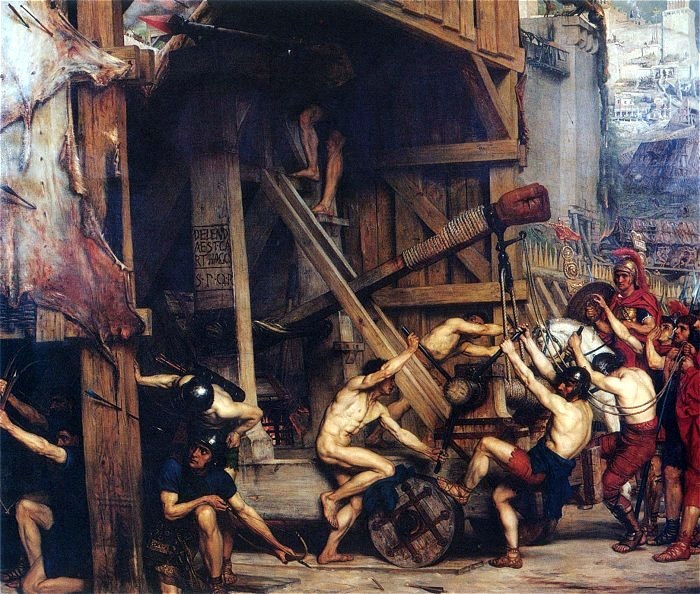 According to Josephus each stone weighed a talent (about 100 lbs), the same weight as the hailstones that strike the Whore of Babylon in Revelation 16:21. In the above Preterist commentary on John 8:3-7, the fulfillment of Jesus’ response to the teachers of the Law and Pharisees was explained in light of the fate of Jerusalem during its war with Rome. See the preterist commentary on Revelation 10:1-2.